I perceive the RGGI as a scheme to protect incumbents - I do not seen it as an instrument creating a market for low carbon electricity. Perhaps Ontario and Quebec see it similarly as, despite exporting 40 billion kilowatt-hours of electricity to neighbouring states in the RGGI, they are inclined to join California's WCI scheme. Californians reduce emissions like they landscape - they find somebody else to do most of the work. 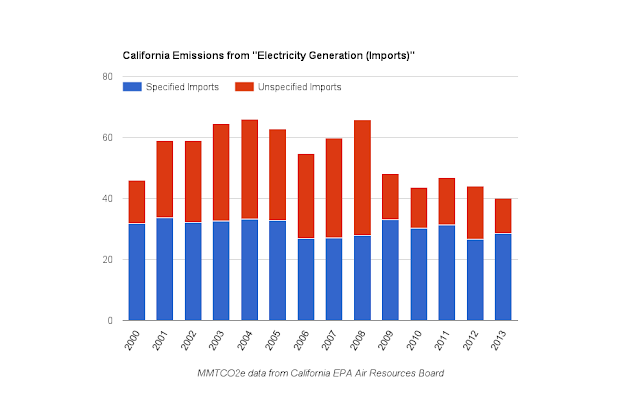 The most recent emissions inventory from the Air Resources Board of the California Environmental Protection Agency covers from 2000-2013. Following Copenhagen I tend to look at a 2005 base, and since 2005 78% of California's reduction in emissions came from the "Electricity Generation (Imports)" sector. Drilling down into the data further, 81% of the reductions in the "Electricity Generation (Imports)" sector came from the "Unspecified Imports" category. Regardless, to the extent BC's carbon tax has worked, view it in the context of doing little foolish with the revenue - that might make it a template for the rest of the world.